The controversy over whether it was Irishman, Edward Bransfield or the Russian Fabian von Bellingshausen, who first set eyes on the Antarctic mainland in 1820, has continued for 200 years. Bransfield had discovered part of the Antarctic Peninsula which he named he named Trinity Land. However, the long debate over who made the first discovery was severely hampered by the loss of crucial documents. The log book of Williams disappeared and has never been found, which left Bransfield’s claim reliant on the surviving charts and some magazine articles about the expedition from the 1820s. But the most significant development was the discovery in the 1990s of the journal kept by Midshipman Poynter, which contains the most valuable first-hand account of the expedition. 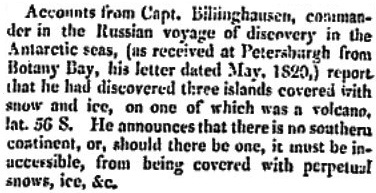 Bellingshausen’s account of his 1819-21 expedition did not appear until a decade later in 1831 and a detailed English language version did not appear for well over 100 years in 1945. More recently, the author Rip Bulkeley has conducted the most thorough investigation ever made in English. Bulkeley received the Anderson Medal from the Society of Nautical Research for his book ‘Bellingshausen & the Russian Antarctic Expedition 1819-20’ (Palgrave Macmillan 2014) ISBN 978-1-137-40217-2. In striking similarity to the fate of Bransfield’s papers, Bulkeley reported that the original manuscript of Bellingshausen’s book about the expedition, his journals and the naval records have all disappeared. “To end this section, so many people have been exercised about a single aspect of the Bellingshausen expedition that the author feels obliged to summarize his reasons for concluding that Bellingshausen was not the first commander to see the Antarctic mainland, even if we accept that he could have done so by seeing one of its major peripheral ice features. First, it was argued in Chapter 4 that Bellingshausen and his comrades had a clear enough ice vocabulary to tell and state the difference between a continuous ice field containing icebergs, and the massive cliffs of ‘main ice’, which was expected to resemble an ordinary mainland apart from its material. For continuous ice, which could be penetrated by icebergs but only to a limited extent by small wooden ships, there were books available, some of them in Russian(Lomonosov,1952;Phipps,1774;Scoresby,1818); next, the vocabulary was small and easy to master; and third, Bellingshausen shows every sign of using it consistently. For main ice, a theory of polar ice caps had been developing for 150 years and was represented in one of the latest maps of the southern hemisphere. Meanwhile a parallel, vaguer theory about land-like ice masses, also known as ‘main ice’, had evolved in the whale fishery and had recently been made available to scientists and explorers(Phipps,1774;Scoresby,1818;J.Ross,1819). Bransfield left the navy in the 1820s and returned to the sea as a merchant mariner, while Bellingshausen resumed in career in the Russian navy. Edward Bransfield died a forgotten man in Brighton on October 31, 1852 at the age of 67. He outlived Bellingshausen, who died on January 25, 1852, by nine months.